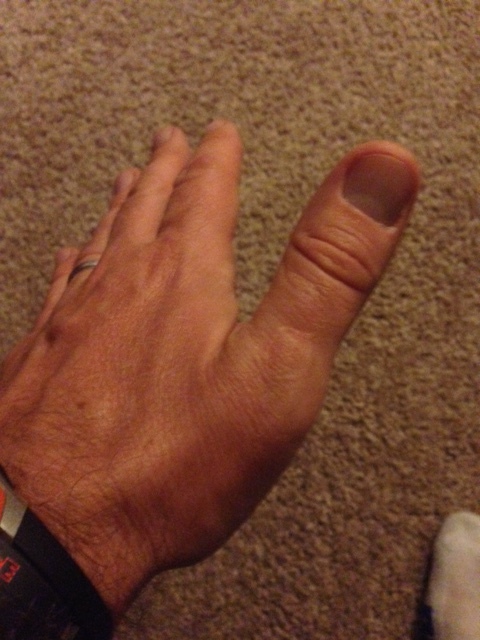 On the thumb of my left hand, I have a scar that looks something like a horseshoe. It is the result of an accident when I was in sixth grade. My family was putting an addition on our house. We were not wealthy by any stretch, so we had to do much of the work ourselves. My father and I were removing a window from the old part of the house. I’m still not sure what happened but the glass shattered. In a very lucky instantaneous reaction, I cover my face. I felt myself get hit, turned and saw blood. The one sidenote that I must make about this story is that my father had been known to pass out at the sight of blood. So at that point, I stripped off my t-shirt and started screaming at my father to get away from me. He thought I was mad at him but then I quickly explained that I was bleeding and I didn’t want him to pass out. I ran to the front of the house and got my mother who took me to the hospital for 18 stitches. I am quite literally scarred for life and I couldn’t be happier that I am. It’s not the accident that I’m happy about. Given the choice I never would want to have a window shatter on top of me. However my reaction to the situation is why that memory creates such a positive feeling about that mark. In a time of crisis, I was able to keep that problem from getting worse by having two people going to the hospital. I was response-able. In no way do I think that we should go out looking to accumulate scars. However there should be no shame in having them either. They are sign that you were not insulated from life. Life has edges that can cut. It’s very common in today’s world to avoid the edges and play it safe. The problem is that you can’t dull every edge nor anticipate when you’ll get cut. So what happens to someone who has spent a lifetime avoiding those edges and they mistakenly get cut? That wound is catastrophic because they’re not ready to be hurt. Failure, disappointment, upset, breakups, and breakdowns are all examples of the scars of life. Don’t pursue them but don’t be afraid of them either. Most of the time they are a reminder of who you have become by fighting through them. Keep fighting through my friends.